Grade A printable DVDs cone in single and dual layer formats. No matter the storage capacity, each DVD format possesses a printable surface area for custom artwork. 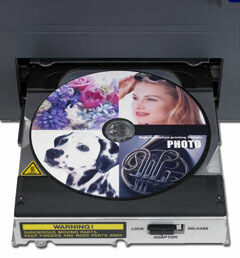 Printable DVDs are also compatible with a variety of printing techniques. They are like a blank canvas for a user’s project; they provide room for creativity without compromising the integrity of the data of the DVD. You should consider a few variables to determine your final project: budget, deadline, visual presentation, and desired shelf life of the disc. Printable DVDs are formulated with distinctive surfaces for compatibility with your printer of choice. Disc printing services are available through a professional duplication service company, but desktop software and other related products are available for at-home printing, as well. When using inkjet printable discs, the printer streams countless dots of ink on a white or silver surface that is subsequently coated with a lacquer to keep the artwork intact. Thermal printed DVDs use a heat-sensitive pigmented ribbon or paper that applies heat and pressure to the disc’s surface to recreate text and simple images. Specially coated DVDs are also available for laser etched disc labels such as LightScribe. With LightScribe, no actual ink or thermal printing is involved, and discs can be written as well as custom designed using one drive.